Illuminated addresses such as this were first presented to WSPU prisoners on their release from Holloway in September 1908. 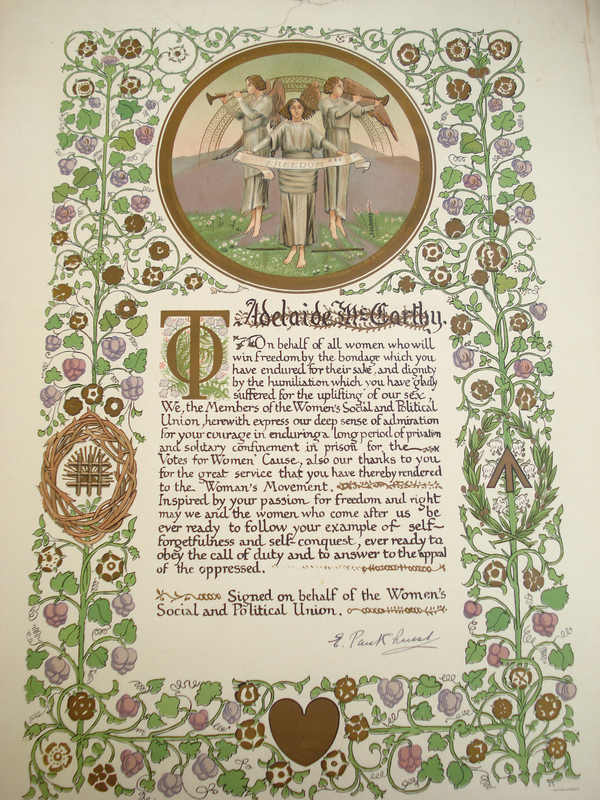 The addresses, signed by Emmeline Pankhurst, were designed by Sylvia Pankhurst and incorporate the purple, white and green colours that the WSPU had adopted three months earlier, in June 1908. The ‘angel of freedom’ device was one that Sylvia was to use on other WSPU artefacts – a neat piece of WSPU ‘branding’. As ever, the suffrage collector needs to be on guard against modern reproductions that pass as the original. As a dealer I was once offered what appeared to be the address presented to suffragette Clara Codd. However, always rather suspicious, my research quickly revealed it to be a copy sold, entirely legitimately, by Bath-in-Time (the gallery of Bath Central Library). I was told that the unfortunate person offering the address to me had bought it as the real thing from a (presumably) rather unscrupulous source. Caveat Emptor. This entry was posted on April 30, 2014, 9:38 am and is filed under Collecting Suffrage, Suffrage Stories. You can follow any responses to this entry through RSS 2.0. You can leave a response, or trackback from your own site.